The decision to maintain the library and continue to grow its collections after Pierpont Morgan's death in 1913 was probably promoted by Belle da Costa Greene, Mr. Morgan's curator and librarian. In 1915 she wrote to the London book dealer Quaritch: "I am glad to tell you that [J. P. Morgan, Jr.] has a strong interest in the library and promised that I may go on collecting books and manuscripts when the war is over." Belle went on to be the first director of the library and effected its transition from private to public institution. In addition to making numerous important purchases for the growing collection, she mounted forty-six exhibitions between 1924 and her retirement in 1950. She was committed to the dictum in Morgan's will that the collection be made "permanently available for the instruction and pleasure of the American people." 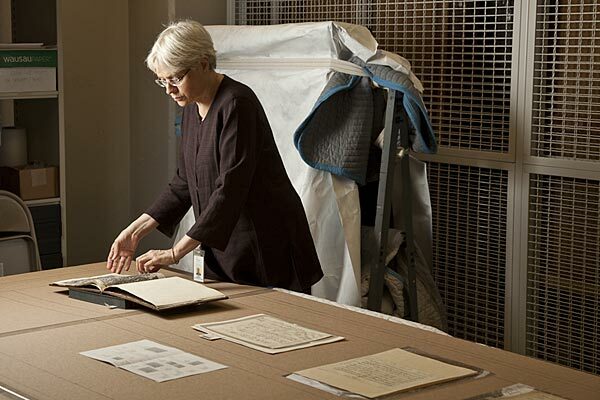 It is in this spirit that new cases have been designed for display of highlights from the Morgan's varied collecting areas in J. Pierpont Morgan’s Library, much as they were exhibited during the early history of the Morgan as a public institution. In keeping with Belle and Mr. Morgan's vision for the library as a place of scholarly learning, current curators and conservators are now working together to select material for the beautifully finished cases that will hold a rotating selection of the collection's greatest treasures. Cases in the East Room (Mr. Morgan's library) will contain a sampling of the extraordinary breadth and depth of the Morgan's collections of printed books and bindings, medieval and Renaissance manuscripts, music manuscripts and printed music, and literary and historical manuscripts. A selection of the Morgan's outstanding holdings of Americana, also drawing on various collections within the Morgan, will be on display in cases in the Rotunda. Curators enjoy the challenge of deciding what to show from the Morgan's vast holdings. Once the pieces are chosen, the curators research them and share their knowledge through explanatory labels that convey the objects' beauty, rarity, and importance. 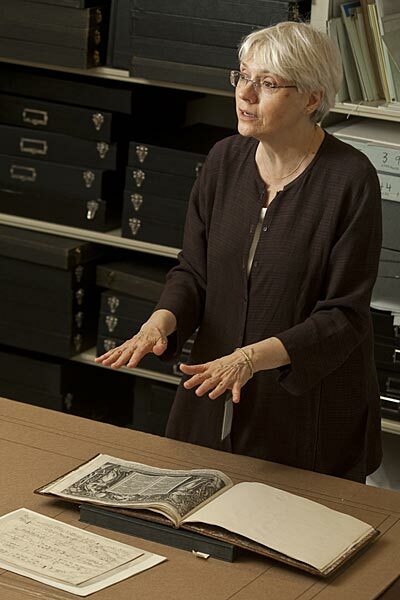 Fran Barulich, Mary Flagler Cary Curator and Department Head of Music Manuscripts and Printed Music, relates the process of making her selection for the cases: "There are many challenges to selecting items for collection highlights: first, will the item fit in the case? ; second, ensuring that new items, in addition to old favorites, are displayed; third, striving for a mix of different types of musical scores—orchestral, vocal, and solo instrumental; and fourth, selecting a page to be displayed that will satisfy the conservation department's concerns and the public's interest. The fun part involves learning about the items and their history in order to write an engaging label and placing the items in the case to see if and how it all works together." 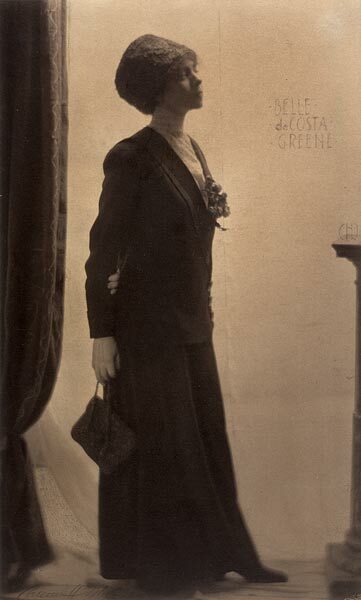 Portrait of Belle da Costa Greene. Hired in 1905 as Pierpont Morgan's librarian and curator, Greene later became the first director of the library and effected its transition from private to public institution. 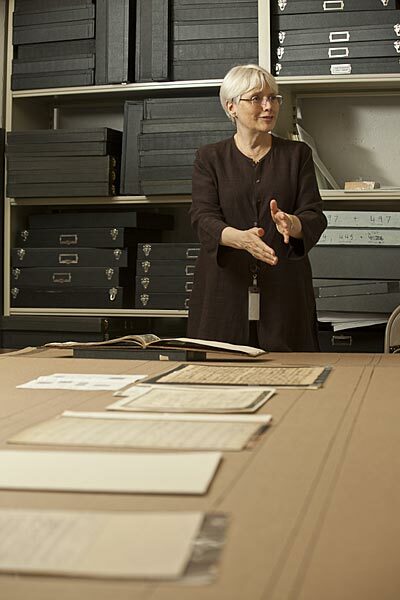 Fran Barulich, Mary Flagler Cary Curator and Department Head of Music Manuscripts and Printed Music, surveys works from her department that will be on view in the East Room after the restoration is completed. The first of six rotations, the works will include music manuscripts by Bach, Debussy, Schumann, Mozart, and Chopin, and a printed book with engravings by Philippe Galle. Fran has placed the works on a cardboard template to determine if they will fit into their cases and at what angle the works should be shown. She explains that the template indicates a space for the works, as well as a four-inch space for the case labels. Fran examines an autograph manuscript of Johann Sebastian Bach's Derr Herr ist mein getreuer Hirt, 1731. Fran explains that since the conservators at the Morgan have treated the manuscript and stabilized the oxidizing effects of the iron gall ink, the manuscript is in unusually good condition. 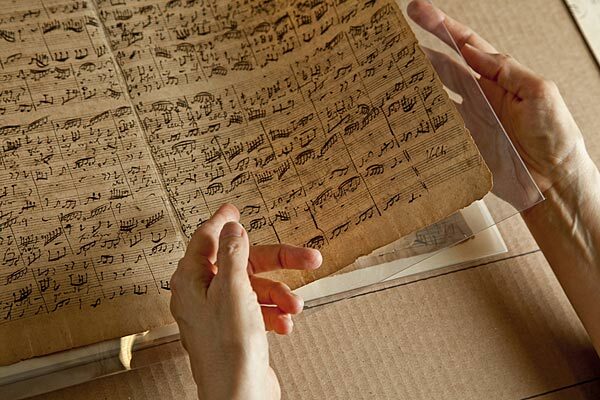 Other Bach manuscripts have suffered from the acidity of the ink which can create holes in the paper and loss of the music. 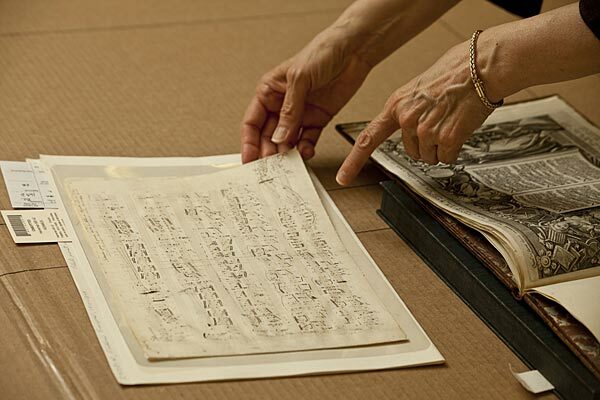 Fran points to an autograph manuscript of Frédéric Chopin's Polonaise in A-flat Major, op. 53 for piano. She explains that Chopin's delicate and spindly handwriting belies the strength and power of the music. She notes that Chopin's musical calligraphy is beautiful and that the handwriting of his copyist Julian Fontana was so close to that of Chopin's own that one can mistakenly take a Fontana copy for a Chopin autograph. Fran discusses Philippe Galle's Encomium musices, ca. 1590, a collection of engravings that illustrate various quotations from the Bible dealing with music. These beautifully executed works depict, among other subjects, angels playing various instruments. The detailed title page seen here is one of the earliest examples of engraved music and is the only source for a six-part motet by André Pevernage.